Cairo – Today, on International Migrants Day, the Global Migration Film Festival draws to a close at the historic Al-Manial Palace in Cairo, Egypt, culminating the most successful edition held so far. 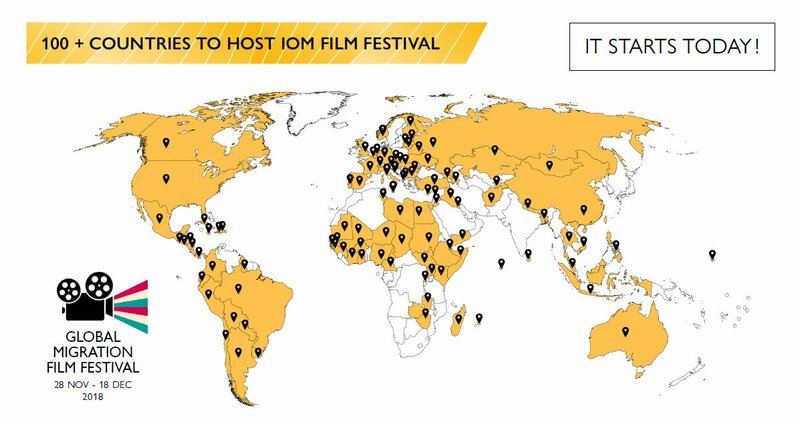 A truly worldwide festival run by the International Organization for Migration (IOM) in partnership with United Nations Information Centres worldwide, it has already seen 558 screenings take place in 161 cities and over 103 countries, a number that is up 50 per cent from last year. Drawing on volunteers from the IOM and its partners wherever it takes place, this year’s festival showcases dramas, comedies, as well as gritty documentaries that bring the reality of the migrant experience to the silver screen. Over 800 films were submitted for possible inclusion in this year’s festival, IOM’s third. IOM’s regional office for the Middle East, one of nine such offices globally, hosts this year’s festival under the auspices of Egypt’s Ministry of Foreign Affairs (MOFA). “We selected Cairo to be the first capital outside IOM’s Geneva headquarters to host the closing awards ceremony of this important festival in recognition of Egypt’s leading cultural and political role in the Middle East and North Africa region as well as in the African continent, and in particular its leadership in migration governance,” said Carmela Godeau, IOM Regional Director for MENA. Opening the ceremony in Cairo is a live music show, followed by welcoming addresses by high-level governmental and IOM representatives, and the award ceremony. The event’s Guest of Honour will be Egyptian superstar and UN Goodwill Ambassador Yosra. “I am proud to support such a great initiative highlighting the important role cinema plays in building bridges through telling stories that give viewers a glimpse into the lives, circumstances and feelings of others.” said Yosra. The evening will also include side photo exhibitions by IOM and the United Nations Information Center (UNIC). Al-Manial Palace is said to have been built for Prince Mohammad Ali between 1899 and 1929. He had the Palace designed in a style integrating European Art Nouveau and Rococo with many traditional Islamic architecture styles including Ottoman, Moorish, and Persian. Historically, the Prince’s family had hosted lectures, concerts and poetry readings in the vast venue and gardens. The palace and estate have been preserved by the Antiquities Council, as a historic house, museum and estate, reflecting the settings and lifestyle of the late 19th- and early 20th-century Egyptian royal family. “We’re pleased to host the GMFF closing ceremony at such a historic and culturally vibrant venue; and to honour the aesthetic of the place we’ve tailored a lively and culturally bound evening. Our ceremony will bring together a big number of celebrities with governmental representatives, diplomats, United Nations representatives, international partners, and the private sector,” said Laurent De Boeck, IOM Egypt’s Chief of Mission.